a). I’ve got a big problem with players that say they want to great basketball players, but don’t properly put the work in to make it a reality. b). I’ve got a big problem with coaches that don’t teach their players how to work out properly on their own. I want to begin by pointing out that poorly working out is not always the players fault. Many simply haven’t been taught the right way to do it. When they go down to the gym and lazily chuck up a few shots while chatting with their friends, a lot of them truly believe they’re working on their game… they just don’t know any better. And I’m here today to tell you that we need to do something about it. We need to teach players how to properly work out. Most of our players are young and it’s up to us to guide them in the right direction when it comes to working out on their own. 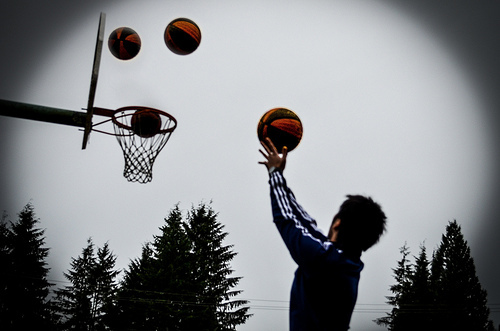 I’m going to share with you three tactics that are imperative to a perfect basketball workout. Any player I’ve coached or trained knows I hate it when players arrive at the gym without a workout plan. How much can you expect to improve if you’re not working on the right things? If you’re not working on your weaknesses? If you’re only doing all the fun and easy drills? Exactly. Not much. Not much at all. You need a plan if you’re going to workout. Don’t have one? If you’re looking to improve your shooting check out my ‘Shooting Workouts’ page where you can find many free shooting workouts. In order to work out effectively and improve your basketball game you need to be taking game shots, from game spots, at game speed. Let me say that again because it’s very important… The only way to get better is to take game shots, from game spots, at game speed. You can’t walk or jog through your workout. You don’t do that in games (well you better not be doing that in games). You have to make your workout as game-like as possible. This means sprinting during drills, exploding into your shot, getting low on your dribble moves. If you finish your workout and you’re not drenched in sweat, you didn’t work hard enough. Tracking your shots has many benefits that I’ve listed in the blog post ‘The Method Used Only By The Worlds Best Shooter’. An article on the great Dave Hopla. 1. You cannot improve what you don’t measure. 2. It makes every shot important. 3. You can set goals. 4. You will see improvements. 5. You will see your weak areas. I hardly see any players with a workout plan. I hardly see any players working out at game pace. I hardly see any players tracking their shots. All three of the most crutial ingredients to a perfect workout and I barely see anyone doing them! You must encourage and enforce that all of your players are doing these. That’s how you’re going to set your team apart from the competition and develop your athletes into much better basketball players than their opposition. 2. All workouts must be at game pace. 3. You must track your shots. Are your players doing all three when they’re working out in the gym?